South Karelian children’s cultural center Metku is provincial children’s cultural network, that includes all South Karelias municipalities; Imatra, Lappeenranta, Lemi, Luumäki, Parikkala, Rautjärvi, Ruokolahti, Savitaipale and Taipalsaari. Metkus goal is to diversify and develop childrens and youths cultural services in South Karelia. South Karelian children’s cultural center Metku is a member of the nationwide children’s cultural centers association. Metku is funded by the Ministry of Education and the Ministry of Culture and municipalities. Metku is 10 years old in 2018! 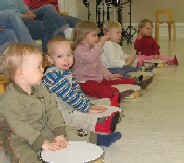 The network-based activity of the Children’s Cultural Center was piloted in 2008 and after a successful experiment the South Karelian Children’s Cultural Center Metku received a state aid program. You can find municipality-specific programs and events by clicking a municipalitys name above. Each mumicipality is responsible for their children’s cultural services independently and updates information related to them on their websites. If you can’t find the information you are looking for on our website, please contact the municipalitys contact personnel. First round of Art Testers is completed! Over 1200 eighth-graders got to enjoy, experience and critique culture. The students visited Lappeenranta art museum and Lappeenranta City Theatre locally. Other destinations were for example: Kiasma, Ateneum, The finnish National Opera, The finnish National Theatre, Cirko and Tapiola sinfonietta. The next group of future eighth-graders begin to sign up on January 2018. The goal of the project is to get finnish youths to experience art. Students will be informed in advance about the exhibitions, artists and art forms. After having experienced art the youths can have conversations not only between each other but with artists and compare and evaluate their experiences in social media. Channels are open for youths thoughts, insights, feelings and opinions. The eighth-graders become art critics – after every visit they give their evaluations on the experience. Read more here. Finnish children’s cultural centers association is an association of professionally functioning children’s and youths cultural centers that strengthens the children’s cultural knowledge and awareness nationwide. The association is a cooperative body for its members, it manages projects and provides children’s cultural operators networking opportunities. The association was founded in Espoo, Finland 19/05/2015. The city of Lappeenranta is one of the founding members and represents the children’s cultural centers association of South Karelia’s Metku network. The Ministry of Culture and Teaching published in February 2014 Children’s Cultural Policy program proposal for the period of 2014-2018. The program proposal secures the status of children’s culture. Children’s Cultural Centres develop and disseminate children’s and youth’s cultural activities in their territories, as well as the whole country via a number of artforms. Every child and youth has the right to culture. A nationwide network of children’s cultural centers helps to get acquainted with culture by promoting equal accessibility as well as children and youths welfare. Especially the low threshold of cultural activities in schools, early childhood education and family work allows for equal inclusion of children in the surrounding community. The assessment of children’s cultural centers 2009-2013 years of operation can be read at the Ministry. Metku network includes the municipalities of South Karelia. Working in partnership with local arts and cultural institutions, schools, kindergartens, different types of associations that maintain recreational activities, churches, businesses, and arts and culture professionals. Clustered approach promotes arts for children and young people and the accessibility of cultural services in the province. Metku seeks to remove obstacles to participation by bringing the culture to the children and young people in schools, day care and clubs. A working cooperation network will also support the producers of children’s culture. Metku through its activities to promote a sense of community and inclusion of children and youths. Contact to art gives a positive emotional experience and develops self-awareness, interaction and acceptance of diversity. Metku increases cultural activity and positive attitude towars culture as well as producing immediate joy and benefit to children, young people and families as well as children’s culture producers and municipalities.